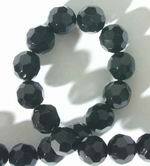 Large Black Sardonyx Flat Oval Beads - Highly Polished! Large Onyx Freeform Nugget Beads - Shiny Black & Heavy! 9 Snazy Onyx Teardrop Beads - Long & Unusual!